NEW YORK (WABC) -- I get the question fairly often. At one time it stumped me. I had to think whether the answer came from my 15 years in the print media or the years after that in television. I'd hem-and-haw, and eventually dodge coming up with an answer to the question: What's the biggest story I've covered? But for the past eight years, I've done little hemming and hawing when asked the question. The answer, unfortunately and painfully, comes all too easily. 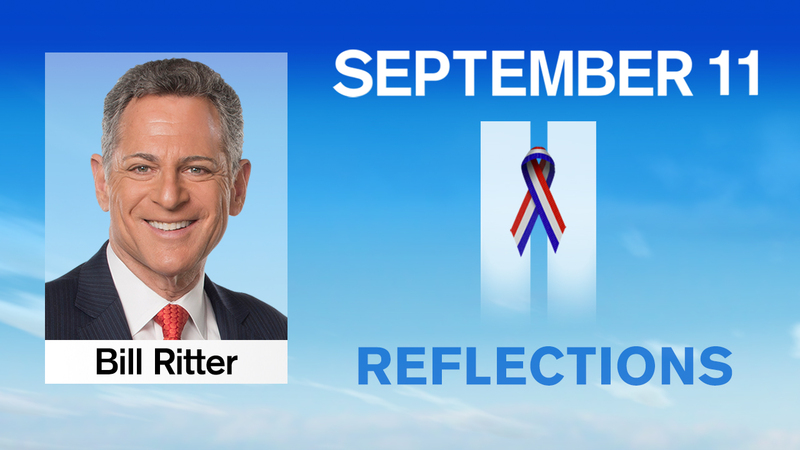 And the truth is, everything else fairly pales in comparison to the terror attacks of Sept. 11, at least if you cover news in New York and the attached metro area we call the Tri State. It is a fateful mistake to view the attacks of that terrible Tuesday as a singular event, removed from the rabid and violent movement of fundamentalist Muslims, or from the arrogance of some politicians in power at the time that poorer countries - often rightly - viewed with anger and from an oppressed point of view. That said, however, this singular event stands as something of a watershed. It has changed policies and lives. Is any of us the same as we were on Sept. 10, 2001? I'm not. In so many ways. I can talk about one rather easily: security, at least in my personal life. I make sure I have available plenty of bottled water, and a little bit of spending cash and some non-perishable food. I now also have a generator - something I never would have had pre-9/11. I find that I am more prepared for the worst case scenario that I ever dreamed of being. We have all been changed by the events of eight years ago. I know my children have. My daughter was 9, my son was 6 - and they quickly became familiar with Osama Bin Laden, and terrorists and Al Qaeda. Does it haunt them still? I suspect in many ways it does. How could it not? Each year, on the anniversary of the terror attacks, I inevitably end up thinking about how that day started, and then reliving the horrible and grotesque details of what unfolded. I hopped into the shower, and turned the TV volume up all the way so I could hear what was happening. It was clearly unclear what was going on. And then another plane hit. I jumped out of the shower, rushed into work, and was on the anchor desk as the second tower collapsed. Sandra Bookman and I stayed on air for hours. Jim Dolan was in and he was monitoring the flood of bulletins, including the one that said a United Airlines flight had disappeared from radar somewhere over rural Pennsylvania. It is difficult not to cry, just thinking about it. The emotions, eight years later, are, I know, right on the surface. It doesn't take much to bring them up; writing these words is enough to do that. It just all felt so wrong, so terribly misguided and horrific. Whatever gripes and complaints the group that did this had against the U.S., whatever valid criticisms they could level against this country - nothing, NOTHING could ever justify the human carnage they caused, and the grief that followed. It is easy to talk about "closure" - but I simply do not believe there is such a thing. The wound can scar over, but there is no closure for a wife who no longer has her husband, or for parents whose child was killed, or for a child whose mother perished that day. Every year around this time, I find myself thinking - enough! Let's have a small ceremony, and take a moment to remember what happened. Why go through with this wall-to-wall televised coverage of the names being read, and the reflecting pool and the prayers. And then the day arrives and I find myself swept up in the emotion of it all, and in remembering what I've written about in this space. And when it's over, I'm overcome - with emotion and grief and a feeling of "never forget." And so - we do it again. I was there for catastrophe. And I've been there for every memorial. And it's my honor and privilege to participate. Before I end, I want to pay tribute to the Coast Guard members who saved so many people that terrible day. They are some of the unsung heroes of Sept. 11. My longtime friend and colleague David Helvarg has just written a book called "Rescue Warriors - The U.S. Coast Guard, American's Forgotten Heroes." "Most people are aware that the U.S. Coast Guard was able to save more than 33,000 people following Hurricane Katrina, when the rest of the government seemed immobilized. Few realize the role they played in New York Harbor on 9/11, when they coordinated the evacuation of half a million people from lower Manhattan after the collapse of the twin towers. "The Coast Guard first shut down the harbor to all vessel traffic following the attack on the second tower. Then, as panicked throngs began fleeing the smoke cloud from the collapsing towers, the Coast Guard's Vessel Traffic Service (VTS) New York put out a call for all available boats in the harbor to go to Battery Park and begin evacuations. Tugs, fast ferries, police launches, fireboats and other working watercraft converged on lower Manhattan as Coast Guard personnel and vessels directed the boat traffic through the smoke and successfully carried out the largest maritime evacuation in world history. "Looking at maps showing the location of Coast Guard cutters on Sept. 10 and Sept. 12, you can also see what looks like a belt being cinched tight around the continental U.S. as the service shifted from a peacetime to a wartime footing. Since 9/11, the number of Coast Guard armed responders has grown from 300 to 3,000 as they've taken over responsibility for the nation's port security. "At the time, it was also decided that putting Coast Guard cutters in New York Harbor would reassure the public in ways that putting Navy ships of war there would not, and so the white hulls of the Coast Guard took to the waters around the city. "There were two disappointing actions as well - one involved an attempt by two Coast Guard helicopters from Cape Cod to rescue people from the roof of the second tower. Unfortunately, as they approached Manhattan, they were ordered to land and told if they didn't, the Air Force would shoot them down, even though they tried to explain they were the rescue helicopters. Also, in the wake of the attack, the Coast Guard environmental strike Team from Fort Dix, New Jersey, arrived on scene and identified Ground Zero as a hazardous site. They required respirators and other worker safety protections. However, when EPA took charge, the risks were minimized and the strike team, while it continued to offer decontamination showers and other help, was not allowed to require protections or even use the word 'decontaminate.' As a result, years later, first responders are still suffering from respiratory illnesses associated with exposures to hazardous materials." My thanks to David Helvarg.